Harmony gives you a taste of village life. Whether you need to visit the doctor, shop for groceries or grab a bite to eat in a bistro, the Village Centre (future development) will be there to supply everything you need. Do you like the idea of visiting an art gallery or two with your family? Or, maybe you and your partner love to golf. The Mickelson National Golf Club is convenient when you feel like hitting the golf ball around. The Harmony community has 25km of walking paths for residents to enjoy. So, if you like to walk, jog, bicycle or take your dog on a daily ramble, you can enjoy a safe and pleasant journey. Have you always wanted to live near the water? Well, living in the Harmony community means you have access to the Bow River where you can swim, fish or take out a non-motorized boat. Just imagine walking to the lake on lazy summer days with your family. With four quality school sites designated in Harmony, you can rest assured your child will be getting an excellent education from grade school all the way up through high school. As an extra bonus, the schools will be convenient to the entire Harmony community so your child can walk with a friend or ride a bike to classes. Maybe part of the reason you’re looking for a new home is to leave behind those exhausting commutes to work. Harmony has a planned employment campus that will contain businesses both small and large. Get the balance you’re looking for between your work and your family life by working in a place that’s so close to home it’s accessible on foot. Put a new spin on what it means to go to work each day! If you're needing to commute into Calgary, you can rest easy knowing you're a little less than 30 minutes away from the downtown core. That is pretty good for living in a peaceful bedroom community out of the city! You're also less than an hour away from the Rocky Mountains, opening up all sorts of activities and adventures you can enjoy regularly. The McKinley 2 is a two storey home with three bedrooms and two and a half bathrooms. This home offers your family 2,440 square feet of space complete with a charming veranda at the front of the house. The McKinley 2 has a spacious kitchen with beautiful cabinets and an abundance of counter space along with an island. The island has a cooktop making it easy to chat with family while you cook. Exit the kitchen area, walk through the dining room and step into the great room where you’ll find plenty of natural light flowing through the space. It’s the perfect room for the family to gather for games, movies or just to relax. On the upper floor, you’ll find the master bedroom which can be the perfect hideaway after a long day at work. Practically any type of decor looks appealing in this airy bedroom. Take a look at the ensuite of the master bedroom and you'll find a tiled shower as well as a stylish freestanding tub. While you're there, don't forget to check out the walk-in closet! The Chelsea is a two-storey home with a three-car garage, four bedrooms and two and a half bathrooms. This 3,038 square foot home has an open design on its main floor. The kitchen in the Chelsea has an island complete with a sink, lots of counter space and a breakfast bar. A convenient, walk through pantry can house all of your canned goods, cooking utensils and more. The open concept of the Chelsea continues with the expansive dining room and great room on the main floor. The great room has lots of space for entertaining friends for the holidays, weekends or any other time. Step into the master bedroom of the Chelsea and you’ll be thrilled with the space and inviting tone of the room. Open the doors to your walk-in closet and you’ll be planning the layout already! 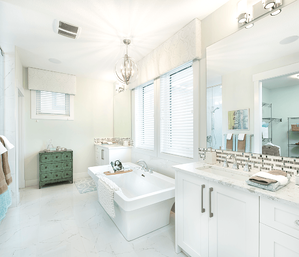 Move onto the attached ensuite and you'll immediately notice the dual sinks, a freestanding oval tub and tiled shower. 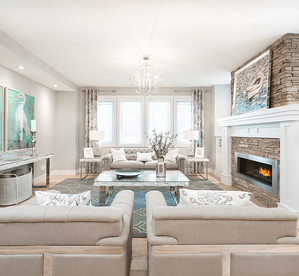 You and your family can enjoy all of the things the Harmony community in Calgary has to offer. And living in the McKinley 2 or the Chelsea? Icing on the cake!